One of the reasons I fell in love with having my own career in direct sales (and even now as a coach) was because of how much fun it was. Being your own boss is awesome. Getting to control your schedule and work around your family’s activities is also a great benefit. Earning free products, prizes and recognition and the confidence that gives you is definitely rewarding. Getting to use your personality and your own creative talents to build something that matters is incredible. The friendships you gain and the relationships you form are life-changing. Owning your own business can be equally as stressful as it is fun sometimes though. There are a lot of responsibilities, pressures and disappointments that will happen along your journey to success. We do not live in a perfect world and there is no such thing as a perfect business or perfect company or a perfect work month, week or day… We will face failures, stumbling blocks and discouragement along the way. However, we do have control over how much fun we have in our business, even during stressful times. Having fun is part of having a positive attitude. The great thing is that attitude is a choice & we all have the power to choose within our own minds & hearts. We can choose to be positive & to have more fun in our business or to get stuck in the pressure and downward spiral of negativity. Remember how much fun it was in the beginning? Remember the excitement of starting a new venture, the rush you felt when you did your first successful party, how great you felt being recognized for your hard work? Think back to how great it was to just work your business for the fun of it. Remember how it was before you felt like you had to reach a minimum or do so many parties or make sure you were in this or that category of recognition? It is always good to take a step back and look at what we are doing and also at how we are doing it. We can’t keep doing the same things and expect different results. If we approach each day and each activity in our business from a place of frustration and negativity, we can’t except for it to be fun or to experience positive results. We need to be sure we are sticking to the basics and not making things more complicated. “People rarely succeed unless they have fun in what they are doing.” – Dale Carnegie. If you want your business to feel less like a job and get back to having more fun then you have to act like it! Our circumstances will not change until our attitudes do. 1. RE-lease it. Stand up. (seriously, stand up, but put your laptop down first) Make sure you don’t have anything in your hands. Now stick your arms out and start shaking. Shake your hands, arms, head, whole body! Shake off all the negativity, the frustration and the bad vibes. Shake it off baby! Every time you start to feel bogged down from here on out, just shake it off! Another great way to release it is to journal, to write out all your frustrations, excuses, negative thoughts and then to tear the paper up as a physical way of releasing the stress. You can also go do something else that is fun and enjoyable to break the negative pattern / thought loop that’s going on in your head. 2. RE-connect with or RE-write your “Why Statement”. Your “Why Statement” is your reason for working so hard and building your business in the first place. It could be that you want to gain financial stability, to help improve your family’s life, to help other people with your products or services, to make a difference in the world, to get to be a work at home mom, to travel the world, to feel a sense of purpose, to earn a new car… Knowing and staying connected to your “why” can often keep you going when the going gets tough. 4. RE-member having fun is a choice and it’s your choice to make every single day, in every single circumstance. Choose to get back to the basics, to focus on helping others improve their lives and to make your business fun again. Focus on gratitude. Write down 5 things you are grateful for and celebrate your progress every step of the way. Focus on taking one positive action at a time to move your business forward and don’t allow yourself to stay in that negative space. Michael Jordan said “Just play. Have fun. 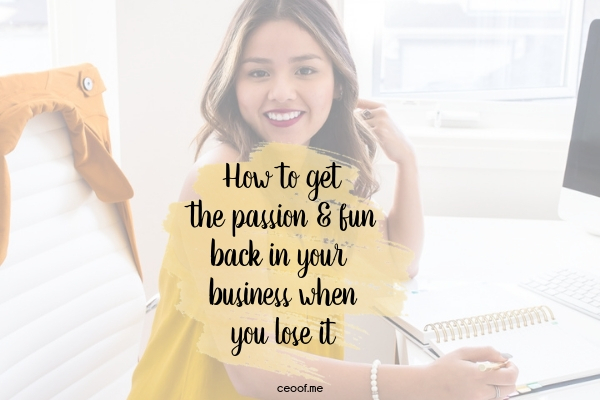 Enjoy the game.“ If you are stressed out, aggravated & downright ready to give up in your business, let me encourage you to focus on putting the fun factor back into your business. You will be amazed at how quickly your business will start taking off again once you let go of all that stress, pressure & frustration! Shake it off & focus on helping others & just have fun! Did you enjoy this post or learn something from it? I would LOVE it if you would leave a comment below and / or Share it. Thank you! This post really applies to me right now. I am not having fun and feel really drained. I am in a slump but I am going to do your suggestions and really try to release all of the pressure and stress and just have fun in the biz. This post also applies to me. I was doing so well, then during my pregnancy I became tired. I felt stressed out by my downlines and uplines. I am mostly not having fun because i do not get the support or recognition from my uplines and my downlines are not coachable.